More people suffer from poor blood circulation than you might think. If you happen to be one of them, then you are in the right place. Compression clothing may help you during work, exercise, travel or recovery. 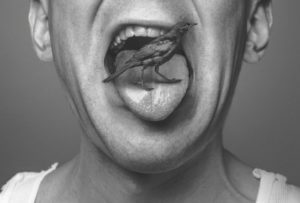 While some people may already know about its benefits, others are now catching on. 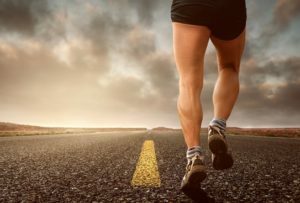 Perhaps you’ve seen runners, frequent flyers or even your favorite athlete wearing a compression sock or sleeve. It’s no longer used solely within the medical field for diabetes therapy. If you thought it was a new trend or for style points, think again. These aren’t your run-of-the-mill spandex gear. If you want to give these socks a try or need tips about them, our in-depth guide can help. Below you will find information and reviews on some of the best compression socks on the market. Scroll to find out more. Skip the Reviews and Check Out these Top Rated Socks. Compression clothing has been around for years and is used to improve blood circulation, boost recovery times and enhance performance. While this type of clothing can be traced back to Roman times, the invention of Spandex is more significant. In 1959, Spandex was created and patented at DuPont. It was as close to natural rubber in terms of strength and elasticity but also resistant to certain chemicals and sunlight. This meant stronger support garments for use in a variety of fields like fashion and medical. Conrad Jobst, a German engineer, is actually credited for inventing the first compression garment for circulation issues. Like many, he suffered from venous insufficiencies so his product relieved varicose vein issues. You will find that compression socks tend to be tighter near the foot and ankle but looser further up the leg. This is not a design flaw. It actually helps to improve blood flow to the heart. Imagine being in the deep end of a pool or diving. The high pressure below forces blood to the middle of your body. Today compression socks have increased in popularity. This stems from the relief and physiological improvements they bring to everyone from NFL players to sedentary workers. Even doctors recommend compression socks to patients recovering from surgery or those with varicose veins and spider veins. Diabetics, people with venous insufficiencies, older people, or those returning to active lifestyles have long used compression socks. Outside of these groups, consumers also realize the effects of compression on swelling. For example, a runner suffering from swelling can use the socks to reduce the discomfort. Further, they can use it to prevent future swelling created by constant force and pressure on the lower limbs. 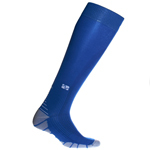 The tightness of the compression sock fabric increases blood circulation to the extremities and muscles. This quick movement of blood from the heart to the body means that your muscles can recover faster from strenuous activity. It also means that your body can get rid of lactic acid and other toxins that can affect normal functions. These socks or sleeves can reduce muscle strains, soreness or damage, by keeping them in a stable and optimal position. In addition, they are a good solution if you suffer from chronic issues like Achilles tendonitis and shin splints. While the material in compression socks isn’t indestructible, it does offer protection for your skin. Firstly, the synthetic fiber is impervious to chemicals and bacteria, which means that it’s odor free and good for your skin. The absorbing nature of the fabric helps to keep your skin dry from sweat. Secondly, as a runner, hiker or trail biker, you will find that the material also shields your skin from bug bites or toxic plant scratches. Some campers wear them to fend off mosquitos as well in the summer, although we doubt that it would stop the most presumptuous of these insects. Most high quality compression clothing will also provide your body with warmth in cold temperatures. Think about 2014 Super Bowl or any other time you might have seen a football game in cold weather. Chances are the players were wearing compression sleeves or socks probably sponsored by Under Armor. You don’t even have to be a professional to wear them. Even casual runners sport them in the winter. Why? In order for oxygen to be delivered to their active muscles, their bodies need to stay warm in cold temperatures. The right amount of compression will basically prevent cramping or fatigue. If you are a frequent flyer chances are you have suffered from swollen ankles or pains from being in one position. This is referred to as “economy class syndrome”. What you might not know is that it exposes a large number of people to the risks of DVT. DVT means Deep-Vein Thrombosis or blood clotting. Individuals with low resting heart rates may experience slower blood circulation at high altitudes. This means that blood can gather in the legs leading to blood clots. Therefore, compression socks can help travelers by decreasing the risk of DVT and promoting optimum blood flow. Ok, Compression Socks Are Great But What Are The Drawbacks? It would be wrong to discuss to the benefits of compression socks without mentioning any possible drawbacks. 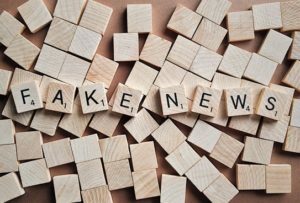 Studies, like the one by Australian researchers in the Journal of Sports Physiology and Performance , have found no other benefit beyond circulation or recovery. However, Companies like Nike and Under Armor are investing heavily in the area of wearable technology. How To Choose The Best Compression Socks? Why do you need compression socks? You can buy compression clothing for numerous reasons such as protection, prevention, relief or warmth. If you want them for a medical condition, then check with your doctor first. Otherwise, you might be looking to buy a pair because you need minor relief from daily strenuous activities. These activities can be everything from exercise, running, working on your feet all day, or traveling constantly. In those cases you probably have aches and pains or swelling around certain parts of your lower body. Using compression clothing to prevent bodily issues is also worth consideration. Studies show that some Americans over 40 tend to experience venous symptoms, so you might want to guard against that. Otherwise, if you are a healthy ox and have no issues, kudos to you. 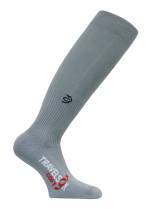 Compression socks are manufactured with five different levels of compression. The levels are determined by the amount of progressive compression exerted on the body, and is measured in mmHg (millimeters of mercury). A good rule of thumb is to consult your doctor for compression over 20 mmHg. Light (8-15 mmHg) – suitable for relieving minor aches and pains from sitting at work all day. Moderate (15-20 mmHg) – if you notice swelling or a heavy sensation in your legs, try socks with this grade. Firm (20-30 mmHg) – useful during pregnancy or to relieve moderate issues caused by spider or varicose veins. Extra Firm (30-40 mmHg) – these are good for preventing or relieving chronic venous insufficiencies. Heavy (40-60 mmHg) – this is for individuals with severe edema, varicose veins or other medical conditions. People with major issues or chronic medical conditions like DVT, arthritis, diabetes, etc. While you won’t necessarily need to consult your doctor if you are in the first category, doing so isn’t such a bad idea. Your options will usually be light or moderate compression clothing. However, those in the second category should seek medical advice for severe conditions. The common materials used to make a compression sock are rubber, spandex or Lycra. Some higher end manufacturers tend to use Merino wool as well. This higher end material is durable, soft and fast drying and soccer players use them to compress their calves. Overall, you need to decide which one you would be most comfortable with, unless you need them for medical purposes. In which case, your doctor will advise you on the best option. Sizing is a confusing factor for many compression shoppers. Fortunately, manufacturers offer their own sizing charts or you can learn how to determine your own size. Ideally your socks should fit snugly around your foot and be comfortable in your shoe. Do not confuse snug with tight, you want enough compression so that it improves blood flow, not restrict it. If all this is too much, just have your doctor or a certified fitter measure your feet before buying a product. Choosing a color is straightforward, just buy your favorite. Style is also another simple decision. Basically you can decide if you want a socks or sleeves, unless you need something like Spanx for your waist. 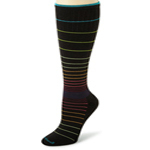 Compression socks like traditional hosiery can be thigh high or full-length. If your knees and thighs are an issue, then this length will be suitable for you. The other options are knee high, which fit just above or below the knee, or calf and ankle height. Compression sleeves are suitable if you want to just target a specific area. For instance you can get sleeves for your thighs, knee, calves, feet or arms. Some people opt for calf sleeves or open-toe ankle sleeves if they wear sandals or just don’t want the full coverage. Foot sleeves are also useful for people with plantar fasciitis. Again, preference is solely up to you when it comes to style, unless you need them for severe venous conditions. 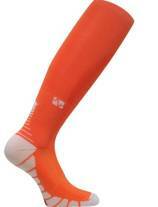 Vitalsox is a longstanding brand that offers some of the best compression socks. These socks are also made in Italy and feature unique absorbing material that prevents sweating. The level of compression is graduated, meaning its tighter near the ankles but reduces slightly further up the leg. This helps circulation of blood back up the leg and to the heart. Although you can machine wash the socks, you can’t put them in the dryer. This means you have to hang them out to dry. As with all compression socks, putting it on takes some getting used to. Thankfully, the video above serves as a guideline. The Vitalsox come in various stylish colors and are also used by both men and women. Once again, before buying you should pay attention to the sizing chart in order to ensure the right fit and to reap the benefits of this extremely popular brand. Sockwell compression socks are made in the USA and have graduated compression. While some of the other socks reviewed are unisex, the Circulator is designed for women. Nurses, teachers and pregnant women have benefited from using the Circulator to relieve aches and pains. The socks are also comfortable, durable and stylish. These traits are easily visible based on the build quality and feel from the time you receive them. Of course this high quality comes with an increased price versus a brand like Fytto but the material and functionality are things you pay for. Be sure to review the compression level and sizing chart before purchasing. The Circulator comes in moderate (15-20 mmHg) or firm (20-30 mmHg) gradients. Knowing the level of padding you need helps you decide which to one to buy. As the name suggests, Travelsox TSS 6000 socks are the best compression socks for flying. However, several consumers have found them useful enough to use on a daily basis. These are some of the finer compression socks available on the market as they are made in Italy. That means that they are a bit more expensive but comfortable and light enough to fit most shoes. The design and material of these socks also prevents friction when your feet are in or out of a shoe. It provides relief in the form of graduated compression so that swelling is reduced and blood flow is increased. Caring for the socks is also easy as you can put them in a washing machine. One thing to be aware of is the sizing, so use this as a guide when buying a pair: Small – US Men 3-6, US Women 4-7; Medium – US Men 6.5-9.5, US Women 7.5-11; and Large – US Men 10-14, US Women N/A. If you don’t move a lot or work at your desk all day then this sock might be for you. The Fytto Style 1067 comes in three sizes of medium, large and extra large. It also has a compression rating of 15-20 mmHg so they are thin and not overly padded. The socks fit comfortably and perform well in reducing minor pains and swelling. They are also easy to put on. Ideally you should roll them onto leg rather than pulling it on. In terms of fit, there is extra material in the toe area to prevent restriction of toe movement. These socks might not be a good choice if spend long hours on your feet during the day. Another drawback is that the increased material in the toe area could be an issue for those who like a snug fit. The socks also require you to hand-wash them. In terms of price, they are affordable and you can get them for almost half off right now. The Sockwell Chevrons are a bit bigger than the Circulators so these would be ideal for women seeking these sizes. In addition to having the same quality make as other Sockwell socks, the Chevrons also have a light-cushioning layer. This layer beneath the foot takes some amount of pressure off your feet if you stand for long hours in the day. A few women have mentioned that they dislike the imprint left on their legs due to wearing the sock. While this is not a design flaw nor does it take away from the comfort and functionality, not everyone likes to see imprints on their legs. Just like the Circulator, the Chevron also has moderate (15-20 mmHg) or firm (20-30 mmHg) levels of compression. Consider these socks if you want something more stylish. Choosing the best compression socks need not be a difficult task. Hopefully this guide provided some valuable information to help with your decision. If you’re convinced that compression socks are worth a try and are looking for more choices, check out some of our reviews.